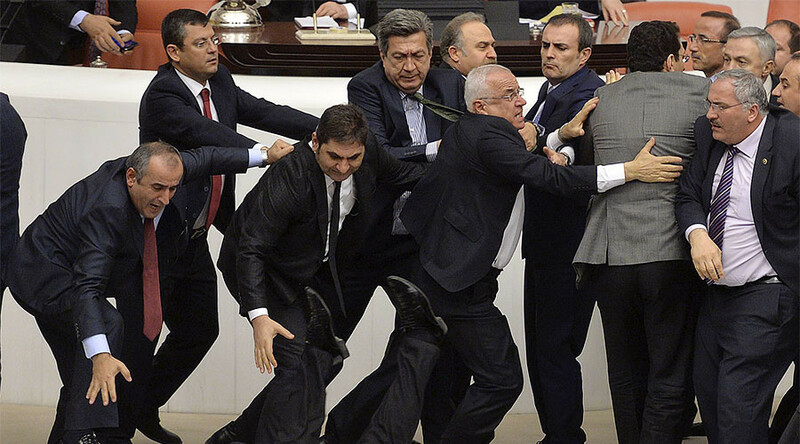 The fifth article of a constitutional reform package has been adopted by the Turkish parliament amid a mass brawl between the ruling party and members of the opposition. Lawmakers convened in Ankara on Wednesday to debate an 18-article series of constitutional reforms that will be put to a referendum later this year. The fracas began when members of the Republican People’s Party (CHP) complained about MPs from the ruling Justice and Development Party (AKP) openly casting their votes in what was supposed to be a secret ballot on the third article of the new constitution. Opposition lawmakers were concerned that the open vote was an attempt to put pressure on MPs who might be considering casting their ballots against the reforms, according to the Turkish daily Hurriyet. AKP members then tried to seize a mobile phone being used by CHP MP Fatma Kaplan Hurriyet to record the vote, which led to her being attacked by AKP deputy Mustafa Elitas. The podium was then occupied by CHP and Kurdish MPs, who exchanged fisticuffs with AKP members. AKP deputy Muhammed Balta was allegedly bitten on the leg by a ravenous CHP member during the melee. Hurriyet, who suffered some minor bruises in the incident, condemned the attack on her by Elitas. “Dear friends, it is not appropriate to physically assault a woman. I condemn you, Mr. Elitas,” she said after order was restored. “And you, Governor Ahmet Gündogdu [another AKP MP]. You physically assaulted me and snatched my phone. Look at the condition of my neck. Your place is your palace, your place is your constitution, your place is dictatorship!” she added. Despite the scuffle, the third, fourth, and fifth articles of the bill all passed in the parliamentary session, with 343 of the assembly’s 550 lawmakers voting to approve. After the constitutional reforms go through parliament they will be put to a referendum, which will determine whether Turkey retains its parliamentary system or adopts a presidential model akin to that of France or the United States. This would eliminate the position of prime minister, which is currently held by Binali Yıldırım, and allow the president to form his own government independently of parliament.